You don’t need a ring on your finger to know that weddings are expensive. In fact, according to The Knot, the average wedding costs around $32,641. 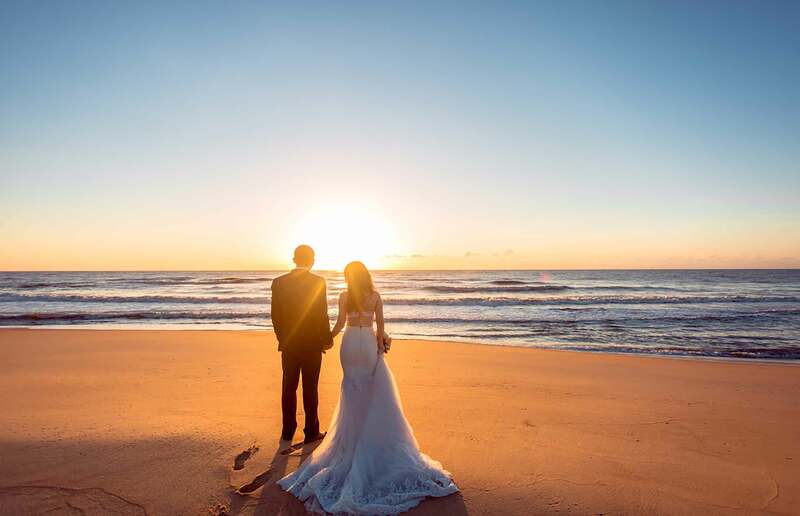 Honeymoons can often be put on the back burner when it comes to wedding expenses, because most dreamy tropical islands and European cities aren’t cheap. But with some careful planning and smart strategies, it’s totally possible to go on your honeymoon for free. Here’s are some ideas as to how. Websites like Honeyfund, Honeymoon Wishes and Traveler’s Joy allow you to raise funds for your honeymoon rather than registering for wedding gifts. In lieu of creating an online gift registry, you could encourage guests to make a monetary gift of their choice to your honeymoon registry website. While some deem it tacky to do so, it has perks for your guests, too. It removes the stress of gift giving and allows your guests to help you afford a wonderful experience with your new husband or wife. Plus, most of these websites allow guests to choose what their gift is going toward, whether it be a tour of Santorini or a wine tasting in Italy. Be wary of the fees these websites charge to either the givers or receivers of the funds. Oftentimes it’s a small percentage, but if you have a lot of gifts, the fees can quickly add up. Also, check that the websites are legitimate — there are a lot of wedding scams out there that can ruin your special day. Whether you have a rewards credit card already, or you’re considering getting one, using the perks that come with it could really help you save on your romantic getaway. If you have a travel card, you could use your rewards to cover the hotel stay or airfare, depending on what the card offers. Or, if you have a cash back card, you can use that to pay for any of the honeymoon expenses you incur. You may also opt to mix and match travel rewards — some cards offer great airline miles while others can reward you with free hotel nights. For example, combining hotel rewards earned by using the Starwood Preferred Guest Credit Card from American Express with airline miles earned or by using the Chase Sapphire Preferred Card can get you a flight and a few nights in a hotel. A lot of cards offer sizable welcome offers that can also be put toward your trip. Be sure to read the fine print — most signup bonuses require a certain spending threshold in a set time period to earn perks or bonuses. If you’re getting a new card, it’s important to take the time to explore all of your options before signing up. And remember, a good credit score is necessary to qualify for many rewards cards. See where your credit currently stands by viewing two free scores on Credit.com. Many giveaways and sweepstakes out there can reward you with your dream honeymoon for free. Plus, winning any trip or cruise in general can make for a fabulously free honeymoon. Trip giveaways are often a hot spot for scammers, so be careful and ensure make sure you’re not being ripped off with hidden fees and taxes. This is a smart option for the less tech-savvy couples who still wish to receive honeymoon funds instead of gifts. Alongside a registry, express that monetary gifts for your honeymoon would be appreciated. Paige DiFiore is the former Editorial Assistant at Credit.com and a Journalism student at Marist College and the blogger behind eyelinerwingsandprettythings.com. She loves soft kittens, sharp wit and even sharper eyeliner wings.